Texas Tea is an IGT classic in a true sense. The developer’s imagination and taste of providing the players an online slot casino game like Texas Tea, which features the feel of Southern US traditional culture, somewhere around Texas area with English Tea sums up the wonderful theme of the game. Aside the theme part, the game is developed in such a way where the players don’t fail to seize any winning opportunities, ranging from base game jackpots to multiple bonus rounds, which is the USP of the game. It is one of the rarest games to have multiple scatter usage in a single game. The classic game from IGT consists of 5 reels and a competitive 9 paylines to win. The simplest way to win the game is to form atleast 3 symbols of similar type starting from left screen to right screen. For players who care to spend and invest a little more time behind the game, stands out for a positive winning rate at 97.35 %. Thus, more often than usual, scoring a win in the game is on the favor of player’s side. Themed symbols: Since the game is based on local lifestyle, some typical icons include Yellow Rose, Barrel Cactus Flowers, Blue Bonnet and Buttercup. As like any game or theory, for the players daring to invest a little more money or risk may stand a greater chance to win bigger prize. The game has a wide betting range varying from 0.05 USD to 5 USD for each rounds. For the players deciding to put bet on all of the paylines and invest 45 coins in total and roll out for spin, the chances of winning jackpot worth 10000 coins pops up invariably. Scatters: Scatters plays multiple roles in the game. There are two types of scatters, viz. Texas Ted and Oil Derrick; both these symbols on being activated starts different bonus rounds of different prizes and challenges. However, for activating both these rounds, the players need to stack more than 3 scatters in the first place. The Machine Logo in the game is the highest paying symbol and pays out as much as 10000 coins at maximum. Wild Symbols as it is works as to substitute any other missing symbol in the reel and plays an important part in scoring a reel win. Oil Derrick Bonus Round: Players require collecting three Oil Derrick scatter symbols to activate Big Oil Derrick Bonus Round. The map consists of a bigger map which has been distributed into 8 different regions. Thus, the players are required to choose a region and one derrick of the area. This opens up the reward scheme and the rewards depends on the fortune of both the region and derrick chosen. With more number of scatters, number of regions and derrick can be given to choose from. The second bonus feature of the game is “The Oil Dividend Check”. The round requires at least three Texas Ted Scatter symbols to get activated for playing. Although this isn’t one such collaborating game, reason because the players might usually notch as ample Texas Ted, specified on a note. Yet, the round plays as a prompt bonus games and allows winning quite some few coins as well. 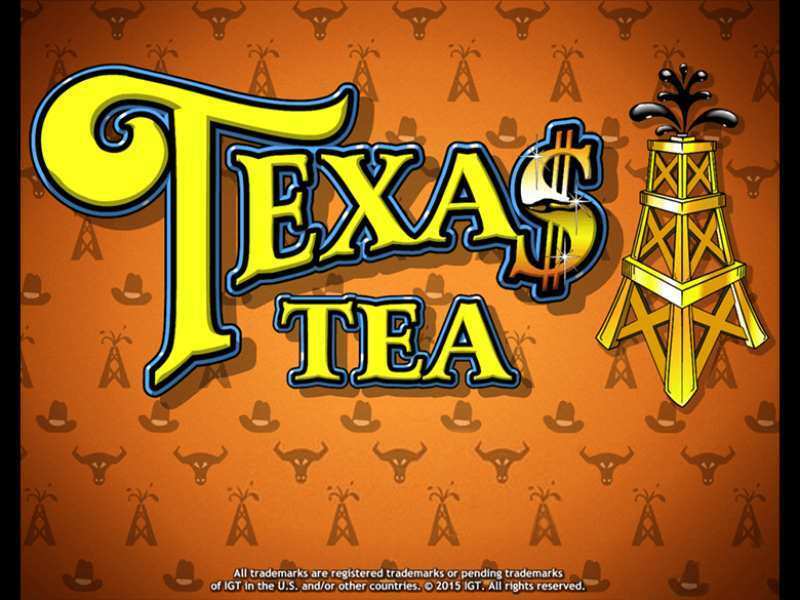 Texas Tea online in one of the best-selling games as made by IGT softwares. The game gives a complete mixture of old fashioned Texas landscape with traditional English Tea and the background of the game suggests even more. Aside the classic slot structure, the game gives out a modest 9 paylines, which might not seem like way too much to ask for, but the bonus features and the offerings are too many to play for. The free Texas Tea slot machine is typically based on online game and is based on the life and style of Southern Star’s Oil fields. The game is available to play across all those casinos which support IGT’s games in popular countries such as US and UK. There is absolutely no downloads required from the players part and they can always play free Texas Ted casino online slot machine game in casinos which offer for free. However, it is always recommended to play for real money in gambling, as more often than ever chances of winning big always increases. 0 responses to "Texas Tea Slot"